Choosing a business app is not the same as choosing a consumer app. You can’t just download and delete it when it doesn’t do what you intended it to. In fact, it’s more like starting a relationship: once you’re in, you’ve committed yourself to making it work. And this is a relationship you’ll want to blossom—a good business applications and software can help streamline processes, manage customers and engage employees. But as hard as it is to simply right-swipe your way to true love, it’s also unlikely that you’ll find the perfect app for your business on first glance. Narrowing down the search a bit, you’ll find that cloud apps are currently dominating the business software market. Why? They give a quick (minimal setup time), flexible (available anywhere) and inherently less committed (they usually work on a monthly or yearly subscription basis) way to carry out business tasks. From there though, things are still pretty confusing. With huge players like Facebook (Facebook at Work) and Google (Android for Work) itching to join the mix, the availability of the increasingly popular cloud business app is growing at an impressive rate. You might have heard big names like Salesforce, Infusionsoft or Zendesk, but if it’s a space you’ve never explored before, it’s hard to know what’s out there, what to look for, and how they compare. Before you make a choice, you’ll want to play the field and do some research. You most likely won’t have time to trial every single app on the market, but what you can do is apply some tried and true methods of vetting potential beaus in order to find that perfect app for your business. GetApp uses a predefined set of criteria for its business app ranking, GetRank, and it’s a great way to get a first impression of an app before diving in a bit further. You’d ask your friends what they think of your new romance before diving headfirst into a relationship, so why not do the same when entering into a potentially long-lasting commitment with a business app? Before making any type of purchasing decision, it’s natural (and advisable) to check what others who are already using the product or service are saying about it online. One study shows that 70 percent of consumers read online reviews before making a purchase, while a similar study says that 63 percent of consumers are more likely to buy a product from a site that includes product ratings or reviews. Checking out review sites like GetApp to see how others have fared with the product will help eliminate the potential mess of trying to get out of something you’ve already committed time and money to. One of the least productive things about adopting a new app is a lack of integration with the apps you’re already using–you want an app that plays nice with others already in your ecosystem. After all, compatibility is at the core of any great relationship. Cloud apps are especially crucial when it comes to integration. One study shows that integrations are one of the biggest hurdles when it comes to the software as a service (SaaS) sales process, with two out of three SaaS companies considering integrations a critical part of their product. Imagine you’re using Dropbox for Business to store files and are considering Slack for collaboration. If they integrate (and they do), you can set it up so that files downloaded from Slack get automatically saved to a designated Dropbox folder. 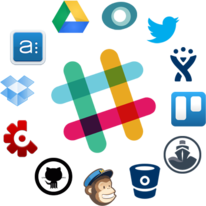 Slack shows off some of its integrations. You’d be hard pressed to find a cloud app these days that doesn’t integrate with at least one other app, but the more integrations it has, the higher the chances are that it’ll co-exist in harmony with the others. The handy old ‘Google them and see what comes up’ trick will get you far when it comes to first impressions… of business apps. See who’s talking about the app online and what’s being said. Also, check to see how active they are on social media– this can give a good sense of the company’s size or popularity in the market (an app with 10,000 followers may not seem like much, but remember, this isn’t Taylor Swift, its business apps). Salesforce is pretty much the top dog when it comes to business apps on Twitter. Media presence also gives a good sense of the maturity of a product. In the SaaS industry, app companies quickly get bought or merge, and if you’re planning to stick to something that’ll go the distance with your company, you want to make sure that they’re operating in a stable environment. Just like you’d expect to have a mobile app for email or banking, you should consider the same for your business apps. This is especially true when it comes to things like a CRM, which you’ll want access to from outside the confines of an office. Basically, you want something that’s available and accessible at all hours and from any location. In this case (and in most cases), having a mobile-friendly website isn’t enough. In fact, 88 percent of online mobile activity happens through apps, with only 12 percent using mobile web browsers on their phones. On top of that, almost 90 percent of business owners check work data from their mobile devices at least once a week, a compelling number that shows the importance of mobile for business. An often overlooked but necessary first-assessment factor for business app choice is security– you want to make sure that your company and its data are safe in someone else’s hands. Cloud-apps still face a huge stigma when it comes to security. Adobe gets hacked, eBay is compromised, and almost unanimously, people freak out. To be able to feel safe in the hands of another, you need to know what to look for when you’re scouting the field. A good place to start is the Cloud Security Alliance, which aim to provide standards for cloud-app security by asking questions including the type of encryption an app uses, where its servers are stored, and who has access to the information. Basically, you want to know how a company will handle your data while you’re with them, and what they’ll do with it if you decide to leave. Choosing a business app is a big decision– you could be using this tool for years to come. While cloud-based software isn’t as hard to get rid of as traditional desktop software (think of it like a less-clingy boyfriend), it can still be a pain to rally employees to use and/or switch business apps. By looking at some first-impression factors, you can get a sense of the potential to create a lasting relationship between your business and the perfect app.